movie summary: The year is 1917 and Canada is a young country that is about to take its place on the world stage by entering into World War I. Sergeant Michael Dunne (Paul Gross) is a solider who has been fighting for the Canadian Forces 10th Battalion and is almost killed when a bomb injuries him. As he lay in the rumble and dirt, Michael passes out only to wake up in the triage centre with a beautiful nurse (Caroline Dhavernas) taking care of him. Michael continues to have flashbacks to his last moment on the battle field where he just stuck his bayonet through the skull of a young solider. He sleeps on the floor until his injures heal and he mustards up the courage to ask the lovely nurse out. She kindly refuses and excuses herself. A fellow nurse tells Michael her name is Sarah and as he walks out of the centre, he doesn’t know if he will ever see her again. Sergeant Dunne returns to Calgary, Alberta where he will serve as a recruiter. His main job will require him to go on a speaking tour to share his experiences of the war and why we the country needs to continues to fight the good fight. While he’s in the office he will interview recruits to help fill the ranks of the military as thousands return home dead. David Mann (Joe Dinicol) is a young 18-year-old kid who has a very beautiful girlfriend Cassie (Meredith Bailey) and desperately seeks the approval of her father. David has been rejected by several recruiters before because he has asthma and Sergeant Dunne refuses him too. When Michael realizes that David is Sarah’s brother, he stops by their house to ask for a date. When that gets shot down he returns with two horses for a ride through the river valley. Michael has fallen head over heels for Sarah but she is really hesitate to like him back since she is pretty messed from the time her father left them. When Michael’s superior officer finds out that Sarah’s dad served in the German Imperial Army, he tells everyone in the town forcing her and her brother to leave. David is so furious that their dad served for the bad guys that he convinces his girlfriend’s father to clear him of his asthma so he can enlist. Sarah is under the impression that Michael signed David up and develops a hatred for him. After spending a few nights together Sarah and Michael began a romantic relationship by sharing their deepest darkest secrets. When Sarah calls him out about enlisting David, Michael doesn’t know what to say because he had no knowledge of this. He feels the only way to make this up to her is by re-enlisting under a false name to be by David’s side on the battle field. Within a few months Private Mann and Private McCrae (Michael Dunne) are in the mud trenches of Belgium where the German Empire threaten to take a small town called Passchendaele. In the pouring rain Michael is called into headquarters where is identity is blown, but instead of facing punishment he promoted to platoon leader. His mission is to head north and engage in hand to hand combat with a group of German soldiers and hold the line so that when the rest of the troops come the forces can capture and hold the town of Passchendaele. The rain continues to come down harder and harder as Michael and David prepare their trenches and guns for the impending attack as Michael must keep his promises to Sarah to protect David and not die. my thoughts: Passchendaele is one of the few mainstream war movies about the Canadian Forces and their efforts in both World War I and II. The most successful mission in Canadian history may be the capture of Vimy Ridge, but the battle of Passchendaele would rank right up there. November 11th is known as Remembrance Day, a day to honour and celebrate the sacrifices of the men and women who serve in the Forces to help protect the rights and freedoms of Canadians. I know several people who currently serve in the Canadian Forces and would like this movie review to be for them and their efforts to help keep Canada, my second home, an amazing place where I get to live out all my dreams. Paul Gross is a well-known Canadian actor who starred in a series called Due South. The show was based on a Canadian Mountie who moved to the United States to solve a murder case and how awkward life was for him to blend into American society. That show put Gross on the map as a mainstream actor and allowed him to follow a passion of his to write, director, and star in Passchendaele. War movies are never for the faint of heart and though this movie is rated 14A there are a few scenes where people lose body parts and heads. Those images are the price of being in war, people dying for their country is the worst part of battles but it drives home the point of how much war can cause a society. People always look at the financial costs of war and rarely do they take a moment to realize the amount of human sacrifice that is involved in a massive world war. Only today do we look back at history and the impact of the death toll affects our plans and strategies for future conflicts. The main point of this story is to focus on three individuals in a time of critical need. Canadians are dying by the handfuls every day and recruiters have tried everything they can to enlist any able man to join the fight only to return home in a box. You get the sense through watching this movie that if you were old enough to serve but were not serving then you were a coward. The Michael Dunne character suffers a lot in the film and even though he served his country honourably, it is not enough to please his superior officers and the people of Calgary. When he’s ready to move on from the bloodshed he falls in love with a beautiful woman who has some deep dark secrets. Their love will try it’s best to overcome the war but in an age where war has been known to tear relationships apart, World War I will bring these two together. One of their biggest hurdles they have to overcome to be together is her idiot brother. David Mann is very misguided and never thinks of the consequences of his actions. He will only come to realize his stupidity while he is sitting in a pool of water in the middle of a muddy battlefield. By then it may be too late to change his mind and the direction of his life but that was the choice he decided to make all for the sake of love. Like I mentioned in an early paragraph, love is the main focus of this story which is supposed to be about the battle of Passchendaele. I remember watching this movie at the theatre and left amazed at the passion shown between Michael and Sarah on top of the great battle scenes. Some of you may watch this movie some day and be disappointed this movie isn’t like Saving Private Ryan, Black Hawk Down, Fury, or any other kind of war movies but it really doesn’t set out to be that way. Paul Gross gives us an epic love story set inside the first world war. Love can overcome many things but sometimes love just isn’t enough to win wars and save lives. 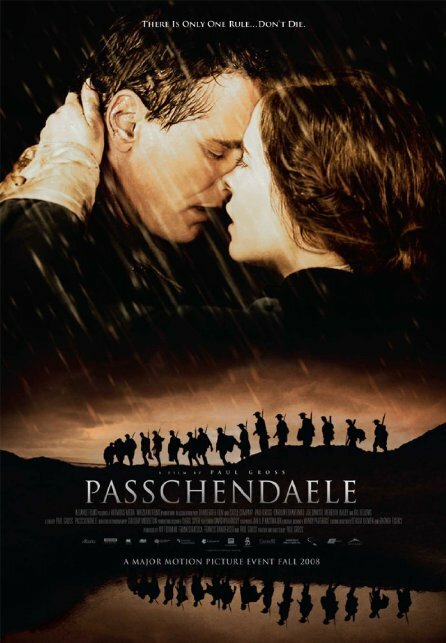 Passchendaele is the most expensive Canadian made movie to date ($20 million according to IMDb.com) and I can see why. The cast is a bunch of rather nobody’s but the action sequences were engineered with the help of real Canadian Forces soldiers who served in Afghanistan and other tours of duty. The writers tried their best to present a real life simulation of the fighting conditions and lifestyle back in 1917, and in my opinion did a fantastic job. In a world where communication was not as advanced as it is today, fighting out on the battlefields was an extremely difficult job back then. 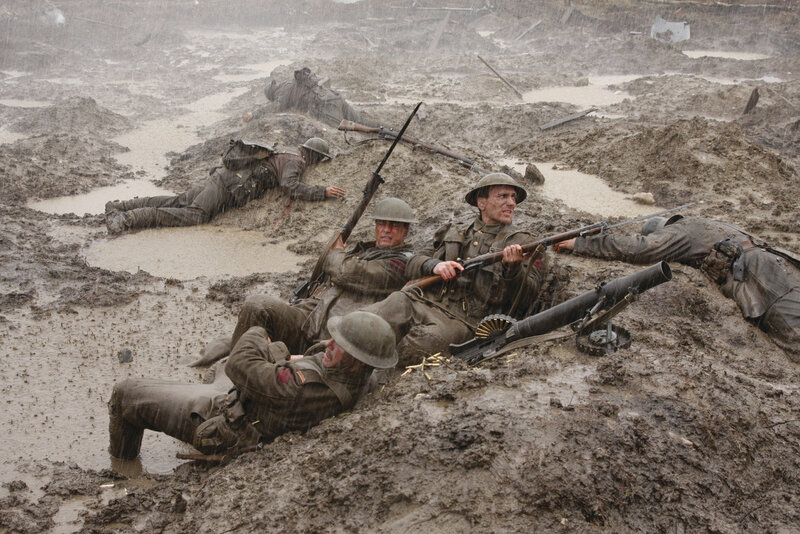 Throw in equipment that isn’t state of the art, the pouring rain, and hundreds of miles of muddy battlegrounds, you will only get a glimpse of what Canadians battled through during World War I.
my final thoughts: According to my IMDb rating, I had Passchendaele a 10/10 rating back in 2008. I am going to stick with my rating even though as I watched it last night I wasn’t drawn into it like I used to be. I still love the movie (since I own it) and love it for a variety of reasons. I feel it showcases Canada in a positive way with breathtaking scenery of southern Alberta and the struggles soldiers endured fighting for the maple leaf. Passchendaele will not be for everyone, but if you’re looking for a solid story with great character development about Canada this may be worth a watch. Maybe you’ll find something to love about it just as much as I did.